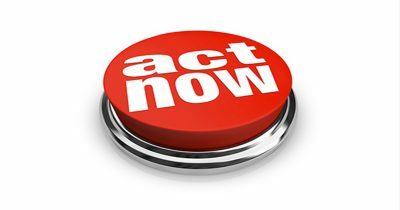 Are you having trouble writing online ads that get people to take action? You’re not alone. The ugly truth of online media is that marketing messages frequently fall flat. It’s not for lack of effort, either – your copy might be a literal masterpiece. 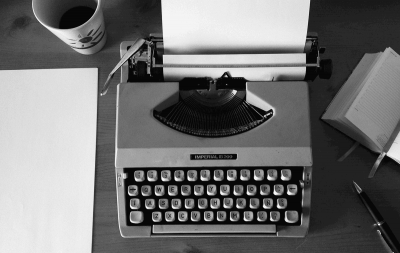 But what good is beautiful marketing writing if it doesn’t yield high conversions? With some simple adjustments, you’ll start to see better performance. Here is a checklist of 9 questions to ask that will transform your sluggish text into supercharged power copy. 1 – Is the value proposition clear? Ads are everywhere on the Internet, which makes them easy to ignore. If you’re less than clear about what you’re offering, nobody’s going to pay attention. Don’t beat around the bush. Don’t treat your ad like the next best mystery novel. Decision-makers will read your ad copy in a flash, so make those moments count. 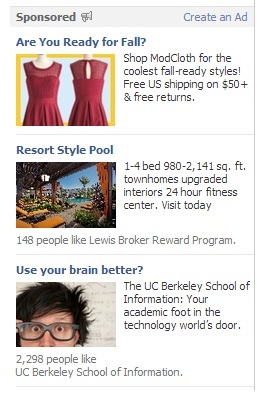 Consider the following three Facebook ads, for example. Which stand out to you? The first ad is appealing because it delivers relevant information in a concise and easy-to-read way. The second is a bit more confusing – The headline “Resort Style Pool” makes me wonder if they are advertising a hotel, apartment, or pool. The third advertisement lacks detail, but it still rocks. The point of the ad is plain, evident, and simple – take classes at UC Berkeley to get smarter. 2 – Can I trim any fat off of this message? 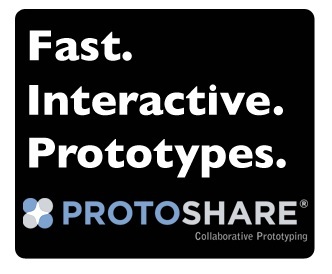 Good ad copy doesn’t need to be long. In fact, you can have more impact when you keep words to a minimum. Eliminate filler words to be as straight to the point and direct as possible. Adjective, Adjective, Noun. Try doing this for your next ad. 3. Am I using action verbs and active voice? When you learned this lesson in grammar school, you probably never thought that it would come back to haunt you decades later in your marketing career. This is an area where writing blends with psychology. When you use passive voice, more interpretation has to be done by the reader’s mind. Less time is spent on what you’re saying, as people are trying to decipher the language. If you need inspiration, consult the following dictionary of action verbs to use in your ads. Here’s an example of action verbs done right. Notice how the ad copy compels the end-viewer to take action. 4. Could I be more personable? As an advertiser, you’re probably immersed in jargon related to conversions, click throughs, behavioral targetting, and leads. If this aggressive language appears anywhere in your ad, you’ll probably scare away your audience. At the end of the day, you’re talking to a person, not a robot. Try reaching your audience on a human level, like the following website feature from ModCloth, a women’s clothing retailer. 5. Am I talking like an ad? People enjoy feeling like targets, right? Wrong, wrong, and wrong. Instead of beating people over the head with BUY RIGHT NOW, engage people on a more subtle, emotional level. Even the most salesy, commercial brands can tone it down. Consider the following example from eBay, a company that is driven by volumes of direct sales. 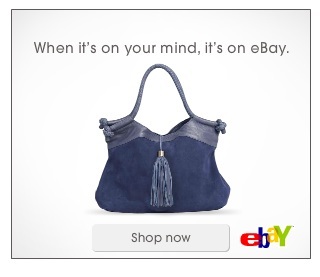 eBay understands that people don’t like to be sold, but they love to shop. 6. Am I communicating urgency to take action? If your language is wishy washy, your audience will be unlikely to take action. They’ll procrastinate, make up excuses, commit to coming back later, whatever. Give them a clear and convincing reason to take action now. 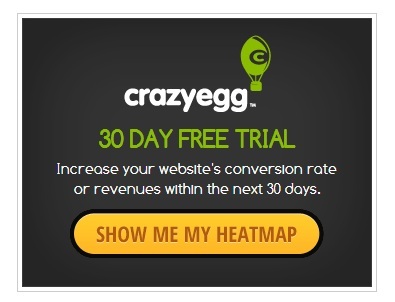 CrazyEgg’s free trial sign-up banner leverages this technique elegantly. The ad provides a logical and compelling reason to take action now rather than later. Better conversions or revenues in a month with no catch? I’m sold. Beautifully done! 7. Am I being informative or entertaining? Instead of focusing on data points and facts, say something interesting. An ad doesn’t need to be boring. It can be completely creative and fun. Taking this approach will help you build an instant rapport with your audience. You’ll also create a more memorable and engaging experience. 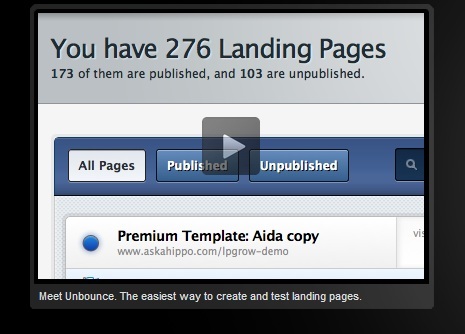 Take a lesson from Unbounce. They’ve embedded an informative video on their homepage. The video quickly shows you how easy it is to use their product. 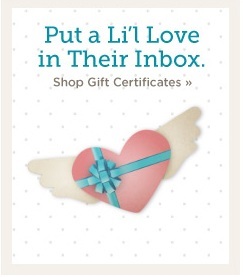 Hey, ads aren’t always in text form. 8. Does the ad communicate trust? There are so many sketchy brands on the Internet who want to steal peoples’ information. Why should people be convinced that your company is any different? You need to establish trust with your audience. You need to prove that your company is a genuine specialist in the service or product that you’re advertising. The design of your ad, the professionalism of the copy and the offer will all play a part in the ability of your ad to generate trust. 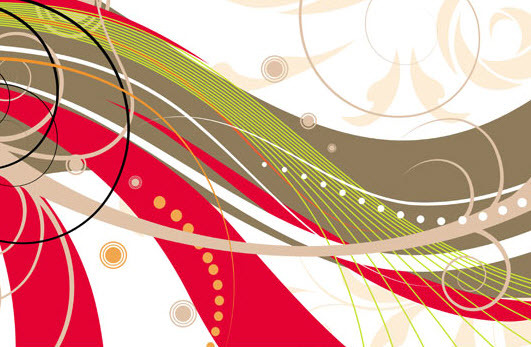 Marketing firm Adhere Creative generates trust through the use of their offer. 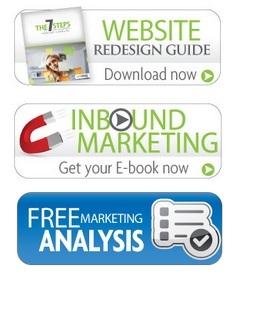 These offers are intended to bring new leads into their sales funnel without risk. Another proven method for generating trust is through the use of social proof. People often make decisions based upon the decisions that others have made. If your ad provides proof that others have made the decision to engage with you, you can dramatically increase conversion. 9. Am I using the language of my market? From start to finish, make sure that your ad flows and makes sense to the demographic that you’re trying to reach. Don’t use jargon in your ad copy unless you are trying to reach a market that uses and understands this jargon. Otherwise, use language that people understand. 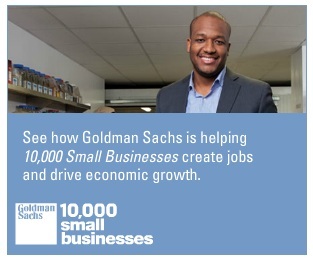 As an example, consider the following LinkedIn display ad from Goldman Sachs. Instead of using complicated business and finance jargon, the advertisement focuses on key concepts that are universally applicable to every small busines owner: (1) job creation and (2) economic growth. Trust your instincts. Do you think that your ads deliver a strong value proposition? Are you communicating information effectively? 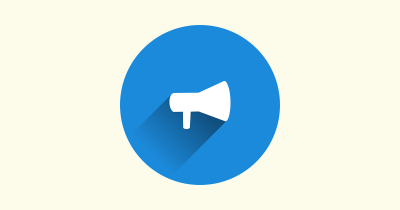 Do you think that your target audience will act upon your offer immediately? Ultimately, you’re trying to spark a conversation with people. Aim to establish a true connection with your target audience. What are some of the most valuable ad copy lessons that you’ve learned? What advice would you share with you fellow sales-driven marketers? Share your perspectives in the comments section below.